At Water Master Rafts we feel that we offer a unique concept in personal watercraft that offers several practical advantages to conventional float tubes and pontoon style kickboats. 1. Backpack on Deck: The dry bag backpack on the cargo deck in this photo contains another complete Kodiak Raft Package. 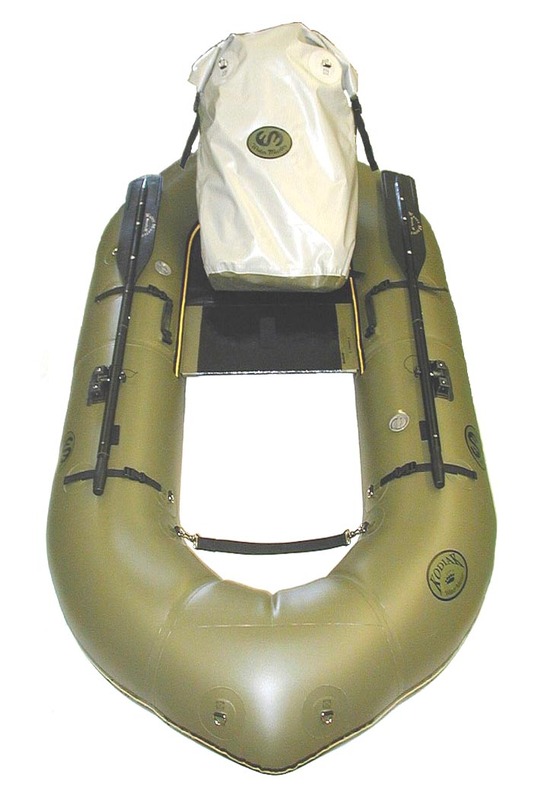 Water Master Rafts are a lot of boat in a compact package. 2. No Frame: The Oars are flat. The Seat Platform is set down in the boat. Compare this to a pontoon style boat with an external frame. The frame is bulky, the oars are cocked up on an angle, and the seat is set up on the frame giving it a high center of gravity. 3. Large surface area: The Water Master Kodiak is a big boat that has an enormous amount of contact with the water. The large "footprint" that this creates results in greater stability, buoyancy, and drag. A higher drag coefficient, especially when your fins are deep in the water, helps the boat to track well in moving water and high winds. High volume, dual air chambers, and closed bow and stern make it a safe choice in rough water. Pontoons were developed with the idea of eliminating surface area (drag) to allow for greater speed. There is simply less boat on the water which translates into a reduction in buoyancy, weight capacity, stability, and drag. Eliminating drag makes a boat faster, but it also negatively impacts a boats ability to track in the water. 4. Performance: Water Master Rafts integrate the primary advantages of float tubes and pontoon style kickboats. Water Master Rafts have a simple, frameless design that makes them easy to transport and assemble. A "Closed" bow design, low seating platform, and high surface area relative to overall size, makes them very stable. Large "footprint" in the water helps them track in wind or moving water. (Like a float tube, but less extreme) Water Master Rafts have a comfortable, dry seating platform 5 inches above the surface of the water. Water Masters have a foot strap that allows you get your legs out of the water completely, and an integrated rowing system that moves the boat efficiently and easily. (Like a pontoon boat but less extreme) Compare on the basis of packability, assembly, carrying capacity, stability, draft, tracking, safety, maneuverability, versatility, functionality, and overall ease of use. 5. Size and Construction: Water Master Rafts are scaled down river rafts. All seams are welded and reinforced, and all components are welded to individual panels before construction. Water Master Rafts have dual air chambers for safety and do not rely on urethane air bladders for air retention. Dual air chambers are separated by a tough 30 oz PVC baffle system, the same system used in large river rafts. The PVC that we use is tough, supple, and can be easily repaired. The Water Master is the ultimate kickboat by virtue of size (inflated and deflated), construction, performance on the water, and ease of use. Made with pride in the U.S.A.